While working on a recent project for Cytanium Windows VPS Servers, I uncovered a little documented feature that I thought was new for Windows 8 Hyper-V, but was actually implemented in 2008 R2 SP1. 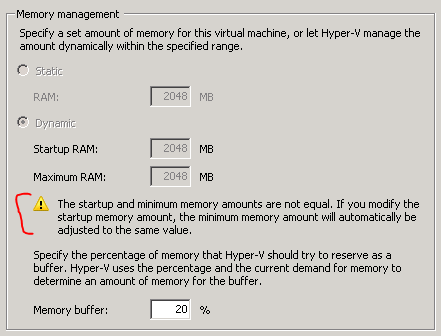 It has to do with the minimum and maximum values for VM’s using Dynamic Memory in Hyper-V. The GUI exposes the concept of startup memory and maximum memory, where startup is the amount exposed to the VM while booting as well as the minimum amount of RAM the hypervisor will allocate to the VM, and maximum being the limit the VM will consume. Limit – The maximum amount of memory that may be consumed by the virtual system. For a virtual system with dynamic memory enabled, this represents the maximum memory setting. Reservation – Specifies the amount of memory guaranteed to be available for this VM. For a virtual system with dynamic memory enabled, this represents the minimum memory setting. VirtualQuantity – The total amount of RAM in the virtual system, as seen by the guest operating system. For a virtual system with dynamic memory enabled, this represents the initial memory available at startup. So, there’s actually three settings where VirtualQuantity and Limit map to the startup and maximum values in the GUI. But what about Reservation? This is actually the minimum amount of memory the hypervisor will allocate for a VM. When you configure startup memory in the GUI or via SCVMM, it’s actually setting VirtualQuantity and Reservation to the same values. The reasoning behind this is simple – Microsoft wants to protect you from yourself. By setting the VirtualQuantity to something larger than the Reservation, you could potentially encounter a scenario where a VM reboots, and the host does not have enough memory to satisfy the VM, and has to power down the VM. This is a non-issue in Windows 8 because of Smart Paging. On the flip side, the value specified in VirtualQuantity is also the amount of memory reported in the VM during boot. So this can cause confusion for some users because the VM may only report the VirtualQuantity on startup, and will always only report the high watermark of RAM allocated – which is typically less than the maximum available to the VM. To prevent this, we can set the VirtualQuantity value to the same as the Limit, and then set the reservation value to the minimum required to run the Operating System. This ensures that the VM always reports the maximum amount of memory available to it, while still allowing the hypervisor to dynamically allocate only what’s necessary to run the workload. One potential downside to doing this is that the amount of in-use RAM could be reported incorrectly inside the VM. However, based on my testing, this occurs when using Dynamic Memory via traditional methods as well. The problem is that Windows calculates in use RAM by subtracting available RAM from total RAM. So, for the above VM, the amount of in use RAM is report as ~1.8GB, rather than the ~600MB that’s actually in use by the VM at startup. Do note however, that this occurs anytime a VM is using Dynamic Memory and bursts above the startup value. The VM always reports the high watermark and encounters the same miscalculation of available memory if the memory demand decreases. This entry was posted in Hyper-V and tagged Dyanmic Memory, Hyper-V. Bookmark the permalink.